Do you struggle with the removal of stubborn smears, water streaks and grime build-ups from your windows? Do they cost you too much elbow grease and you don't want to engage in this chore? This task will no longer consume a lot of your time and efforts! The specialists of window cleaning in Chingford Hatch are willing to give you a hand! You will be able to use your spare time as you wish – the fully instructed and trustworthy experts will take care of the wiping and cleaning. We provide thorough cleaning services for all types of windows. Read further and discover more about the different benefits you can enjoy. We also provide our professional services in nearby areas: Gilwell Park, Chingford Green, Highams Park, Hale End, Chingford. We use the most advanced procedures to ensure you receive highest quality window cleaning. With our water-fed extension pole system and high pressure cleaning methods, you will enjoy perfectly clear look of your windows. We connect our poles to water reservoirs in our vans to ensure that there is no danger for the exterior of your dwelling or business premise. For high-rise windows, we employ absolutely secured rope access method. You can benefit from these cleaning techniques now – just ring 020 3746 3113! You can rest assured that the good look of your commercial building is granted. The professionals will will fulfil your need of second-to-none commercial window cleaning. With our water-fed extension pole equipment, you will witness quick and splendid cleaning of all windows all the way to the fourth floor. For taller buildings, we proceed with our rope access gears. It is our advanced method of reaching glass panes on taller edifices. No matter what is the size of your business premise – a humble corner shop or Heron Tower – we will leave a pristine look of your windows. You can depend on the abilities and competence of the experts for cleaning all kinds of windows. The glass surfaces in our proficiency are: single or double windows, sash ones and bay windows. Of course, if you have French doors, garden windows, greenhouse or skylights, we will make them sparkle, too. With our advanced ways of working and latest equipment, we can cope with all kinds of window cleaning, even with difficult to reach glass panes. 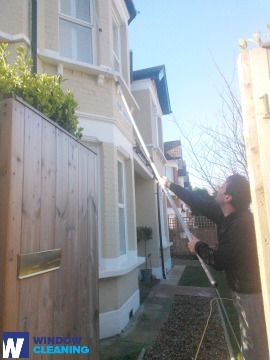 Benefit with our prompt and dependable domestic window cleaning in Chingford Hatch. We will clean the windows of your home both inside and outside. The solutions we use are environmentally friendly - you will have the great end-results and be green aware. Furthermore, we use only purified water. Don't hesitate, call 020 3746 3113 and order our top-notch services. Our customer care staff will assist you – they are on-call 24/7. Another ways of booking – our request-a-service online form or just chat with our customer care assistants.